(From left to right) Pao-Feng Tsai, Ph.D, R.N., Cathrin Carithers, D.N.P.,R.N., Charlotte Dillon, M.N.Sc., R.N., Anita Mitchell, Ph.D.,R.N., Fermin Renteria, M.N.Sc., R.N., Donna Gullette, Ph.D., R.N., and Kelly Betts, Ed.D., R.N., celebrate the UAMS College of Nursing's four programs to receive maximum accreditation from the Commission on Collegiate Nursing Education. 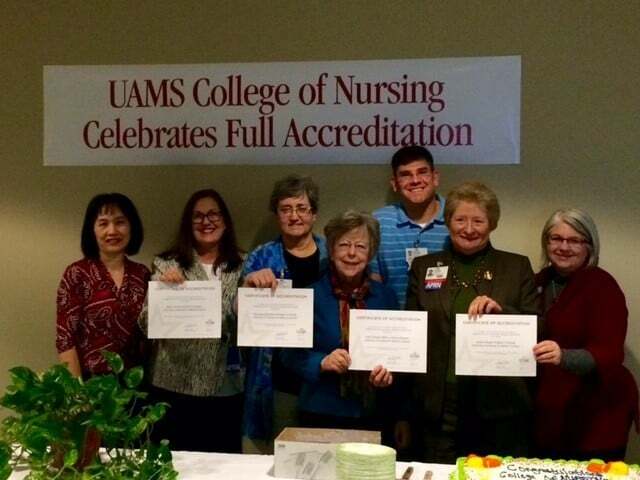 Dec. 15, 2015 | Dec. 15, 2015 | The Commission on Collegiate Nursing Education has granted maximum accreditation to four programs in the College of Nursing at the University of Arkansas for Medical Sciences (UAMS), the only university in Arkansas to have all four accredited by the commission. Three programs received 10-year accreditations — Bachelor of Science in Nursing, Master of Science in Nursing and the Post-Master’s Advanced Practice Certificate. The Doctor of Nursing Practice, which began in 2013, received a five-year initial accreditation, the maximal length awarded to new programs. The college is also home to the state’s only Ph.D. program in nursing, however, the commission does not provide accreditation for Ph.D. programs. The Commission on Collegiate Nursing Education serves higher education institutions and acute care hospitals throughout the United States for the purpose of ensuring the quality and integrity of baccalaureate, graduate and residency programs in nursing. It is recognized by the U.S. Secretary of Education as a national accreditation agency. 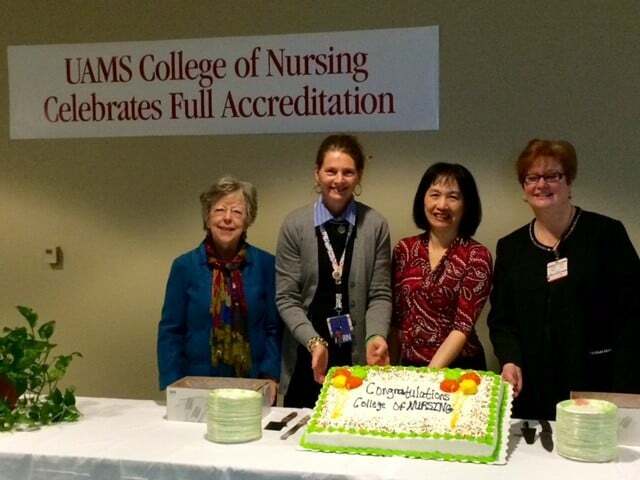 (From left to right) Anita Mitchell, Ph.D., R.N., Claudia Barone, Ed.D., R.N., Pao-Feng Tsai, Ph.D., R.N., and Donna Middaugh, Ph.D., R.N. The accreditation is a non-governmental, peer-review process that operates in agreement with nationally recognized standards established for the accreditation practice throughout the country. The commission’s standards for accreditation include reviews of the program’s mission and governance, institutional commitment and resources, curriculum and teaching-learning practices, and assessment and achievement of program outcomes. Each institution is required to submit a report to the commission, which addresses each standard. The process includes an on-site visit over multiple days that involves meetings with students and institutional and external constituents. The commission visitors observe classroom, laboratory and clinical experiences of students and review documents supporting the overall quality of the programs, including student evaluations of courses, clinicals and faculty, as well as student graduation, licensure and certification pass rates.